Many years ago, on the site of the present day "Pavillion", was a bathhouse, restaurant, and dancing pavillion. It was visited by Huey Long, Louis Armstrong, and Teddy Roosevelt. The present owner was born and raised in "The Rubie" and recalls having no electricity or running water in her camp/home. (Times-Picayune, 11-21-99). "The Pavillion", located at the end of Paris Road, marks the eastern end of the Hayne Boulevard camp area. It survived Hurricane Georges. 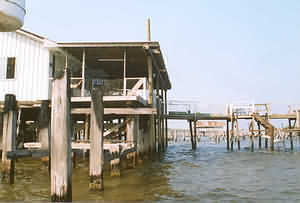 They have had camps over the water on the eastern shore of Lake Pantchartrain for over 100 years. This particular neighborhood is called "Little Woods." The main street of Little Woods is named Hayne Blvd. When hurricanes come every 20 or 25 years, many of the camps are easily blown down, beacause the camps stand on sticks or pilings on the water. Some of the camps are small, simple rooms and some are large, complete houses. Nearly all of the camps have electricity and plumbing. Very few of the camps have air conditioning because they get their coolness from the lake. My grandfather's cousin, Helen Bourda, lives on Hayne Blvd,near Paris Avenue. She has a camp out over the lake that is still there. To get to her camp you must walk over the levee and across the railroad track. Her camp, and most camps, are connected to the land by long, narrow piers. I have been to her camp a few times for family get togethers. Sometimes you can see fish swimming under the camps. A long time ago, about 100 years, there was a very big camp in Little Woods,near what is now Paris Avenue. It was called "The Rubie." It was named after one of my ancestors. The Rubie was a restaurant, a night club, a dance hall and a bathhouse all combined. The Rubie was there before they had roads out there. People would get to The Rubie from New Orleans by train. The Rubie was a favorite and popular place of many New Orleanians for over 50 years.